FINISH: Yellow finish. Also has a "Do The Right Thing" and a Boston Celtics stickers on it. 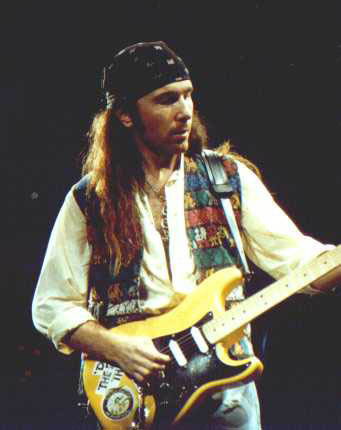 DETAILS: This appeared to be The Edge's main Strat during the 1989-1990 Love Town tours. It can bve seen in the LoveTown documentary in Australia as well as later Love Town era shows at the Dublin Point Depot. It has (3) Golden Lace Sensor pickups and 25db boost. OTHER NOTES: Is it possible that The Edge had proto-types? Here is my question. Per another article, the original production guitar was available in three colors — charcoal gray, Torino red, and 7-Up green. 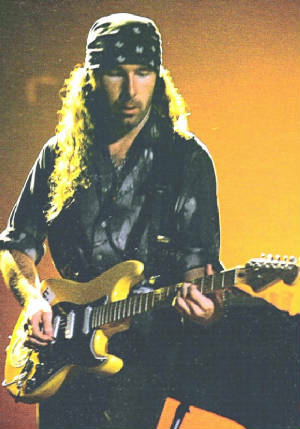 Per Clapton's request, the color black was not offered initially, but was added as an option around 1991. Alpine white was also added about the time of the "Nothing But the Blues" tour. Edge had a red (didnt' look Torino) and a yellow (Bono called it Vanilla) and then there is the painted one... which may have started out charcoal and not pewter.